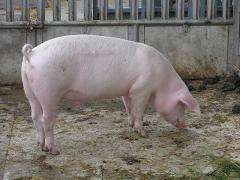 (PhysOrg.com) -- A global collaborative has produced a first draft of the genome of a domesticated pig, an achievement that will lead to insights in agriculture, medicine, conservation and evolution. A red-haired Duroc pig from a farm at the University of Illinois will now be among the growing list of domesticated animals that have had their genomes sequenced. Researchers will announce the achievement Monday (Nov. 2) at a meeting at the Wellcome Trust Sanger Institute in Hinxton, England. "The pig is a unique animal that is important for food and that is used as an animal model for human disease," said Larry Schook, a University of Illinois professor of biomedical sciences and leader of the sequencing project. "And because the native wild animals are still in existence, it is a really exciting animal to look at to learn about the genomic effects of domestication," he said. The sequencing project involved an international team of scientists and genome-sequencing centers. The USDA National Institute of Food and Agriculture, formerly the Cooperative State Research, Education and Extension Service, provided $10 million in initial funding, requiring that this be the only pig genome-sequencing project in the world, that it be a public-private partnership and a global collaborative effort, with significant financial or in-kind support from the other participating agencies and stakeholders. The effort cost about $24.3 million, with additional support from the USDA Agricultural Research Service and many other American, Asian and European funders. Another requirement of participation was that the findings be made public, with no proprietary interests allowed. The draft sequence, which is about 98 percent complete, will allow researchers to pinpoint genes that are useful to pork production or are involved in immunity or other important physiological processes in the pig. It will enhance breeding practices, offer insight into diseases that afflict pigs (and, sometimes, also humans) and will assist in efforts to preserve the global heritage of rare, endangered and wild pigs. It also will be important for the study of human health because pigs are very similar to humans in their physiology, behavior and nutritional needs. "We are excited to have the swine genome sequence and anticipate this will accelerate the rate of genetic improvement in swine as the bovine sequence is impacting the dairy industry's genetic gains," said Steve Kappes, deputy administrator of Animal Production and Protection for the USDA Agricultural Research Service. "We are delighted to have contributed to this important collaboration," said professor Allan Bradley, the director of the Wellcome Trust Sanger Institute, which performed most of the sequencing. "This sequence provides a tool of real value in helping the research community to better understand human diseases, in particular by facilitating cardiovascular, pulmonary, gastrointestinal and immunological studies. Thanks to the immediate release of sequence data as it has been produced, the scientific impact of this research is already being felt." "This is an exciting scientific breakthrough that can lead to new research applications and innovations at many points in the pork chain and one that the Pork Checkoff is proud to help fund," said Everett Forkner, a pork producer from Missouri and member of the National Pork Board's animal science committee.